Tonight on NBC their new criminal drama, THE BLACKLIST starring James Spader continues with a new episode called, “Anslo Garrick.” On tonight’s show Liz gets caught in an elevator and tries to figure out what is going on. Did you watch the last’s episode? We did and we recapped it right here for you! 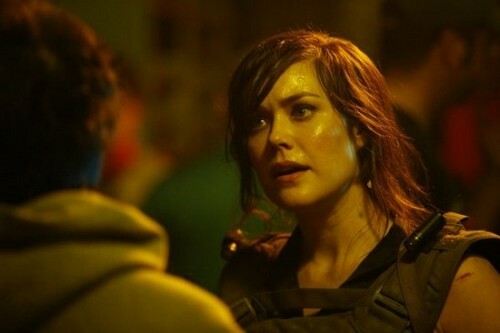 On the last episode Liz (Megan Boone) uncovered an elaborate plot to destroy the country’s financial system when a new name on the Blacklist was revealed by Red (James Spader). Meanwhile Tom (Ryan Eggold) supported Liz when a family member falls ill. Diego Klattenhoff, Parminder Nagra and Harry Lennix also starred. On tonight’s show Donald (Diego Klattenhoff) attempts to protect Red (James Spader) from a possible assassination attempt but is misled. The newest member on the blacklist, Anslo Garrick, (guest star Ritchie Coster) infiltrates the FBI black site and tries to capture Red. Meanwhile Liz gets caught in an elevator and tries to figure out what is going on. Harry Lennix and Parminder Nagra also star. Tonight’s episode of The Blacklist is going to be great and you won’t want to miss it. So pop some popcorn, grab a snuggle buddy, and definitely tune into this hot new series! While you wait for our recap, hit the comments and let us know if you are excited about this new series. RECAP: It starts off with Red in Germany, he’s drinking with a bunch of people having a great time; then someone arrives and Red goes and gives him a hug greeting him a man named Donald. Red says that Donald has to walk a terrible tight rope every day, describing how stressful his job is. Donald tells Red that she needs him, and that he has a plane for him; but Red says his jet is faster and leaves. it shows Liz with her husband Tom, Liz can’t believe that her father is gone now; Tom is trying to comfort her. Tom walks off to leave Liz alone for a bit, she’s looking through boxes and finds pictures of her and her father. She looks at the pictures and puts them back in the box, then takes out a plush bunny and has a flash back of the bunny being burnt along with a doll and a child’s room. She begins to cry more, it cuts to Ressler who’s brought a man in, Harold tells everyone to leave. Harold and Malik talk to what’s going down with Red, that there’s a price on his head. Red doesn’t seem to be too worried about this Intel, he says that it’s crap and that instead they’re going to attack the facility they work in. Red says that Garret is wanting to get into the facility, and wanted him to be here to make it easier. Red goes on talking about Garret and what he’s done, he’s arguing with Malik and the others. Liz is walking into the facility, a garbage truck comes near the facility and parks out side of it. Red talks about Garret’s heavily armed and greatly skilled mercenaries, and about how Garret is bullet proof in a sense because he put a bullet in his head and Garret still lives. The mercenaries are invading the facility, they’re cutting the power to it right now. They cut the power right when Liz is in the elevator, it cuts to Red saying they’re in. The mercenaries are starting to do there thing, Liz seems a bit confused in the elevator. The mercenaries are making they’re way through the parking lot now and are taking out the guards of the facility with ease so far, Ressler is going to take Red into the box. Harold is making a call for an evaluation from the building. Liz is tuck in the elevator still ,she takes of her jacket and shoes, she begins to hit the top of the elevator with her shoe to escape the elevator. Harold, Malik and Ressler along with Red are making their way to the box. Red is telling them what Garret wants to do with his mercenaries invading the facility. Red says that wouldn’t Ressler like to have him dead instead, Ressler says that he’s got a responsibility to protect Red’s life even though he’d like to take it. a Mercenary opens the door and shoots Ressler in the leg, Red hits the floor and gets the cuffs off him and takes a gun and bullets. Red takes the bullet proof vest and ammunition, then he drags Ressler across the floor. Liz is climbing out of the elevator, Red gets Ressler to open a door for him, Red shoots the in case of evacuation glass. Ressler runs into the box for cover while Red is covering him, Red gets in while shooting his shotgun he obtained and then the box is closed. Liz is making her way through the elevator. Ressler is in a lot of pain because of the wound in his leg, it’s bleeding very bad; Red gets Ressler to lye on the bed and now Red is going to treat his wounds. One of the mercenaries are talking about how he can find Red no matter where he goes and how he’s been working with the police. The mercenary continues to talk and talk about how it’s his day to kill Red. Harold and the FBI are getting prepared to deal with the mercenaries, Harold asks where’s the best place for the mercenaries to hack them, and the bearded officer says the main generator room. It cuts to Liz who’s gotten out of the elevator shaft, she’s found the dead officers; Liz picks up the radio and talks to Harold. Harold tells her to do nothing because of the people who’ve invaded the facility and asks her if she’s okay, Liz says she’s fine and it cuts to Red helping Ressler with his leg wound. Red tells Ressler to prepare himself because it’s going to be very painful. Red takes a clip from the hand gun and a tie and begins to tie it around his wound. Red tells Ressler to keep pressure on it, the mercenary tells that the only way to save Ressler’s life is to come out of the box, he says that if Red didn’t do that job in Brussels he wouldn’t be here now. The mercenary says that it’s Red who can spare or end Resslers life, Red says that now hes looking at the man he wonders why he hasn’t gotten a plastic surgeon to fix his scar, but more importantly the eye. The mercenary says they were partners before, Red says that they never were. Red says that he’s done what he always does beat him, the mercenary shoots the box and it ricochets off the box and hits one of his soldiers behind him. The mercenary mentions that he’s brought many people to this party, and sooner or later Redwill let him in. The mercenary has decided to try and blow up the box. Liz is walking through the facility with a hand gun, she’s clearly nervous about the situation. Harold and Malik are fighting a couple of mercenaries, while bearded officer is in the main generator room trying to get the power back on. The mercenaries have got Harold and Malik beat at the armory, Harold calls to warn the rest he’s been caught. A phone is on the table calling for help, one of the mercenaries fall for it; Liz comes up from behind with her hand gun and a makeshift silencer on it she made using a water bottle. She tells the mercenary to not move, the mercenary doesn’t listen and ends up getting shot. Bearded cop has gotten surveillance around the facility by using his laptop, he sees both Malik and Harold being captured. Liz takes the body armor the Mercenary was using. The head honcho of the mercenaries makes a call to all the other mercenaries and tells them about the explosive that’s going to go off at the box. Red is still trying to save Ressler, he asks what blood type Ressler has; Red needs to give a blood transfusion to Ressler. Both Red and Ressler have the same blood type, which is a lucky coincidence. Ressler is surprised to see that Red is actually giving a blood transfusion, because of how much he hates Red. Red says that he knew about Brussels, Red says that when someone is dying in front of you should save them. Red tells Ressler about how he saved a man once, and that man came to kill him a month later, then a month later after that Red broke that man’s neck. Red proceeds with giving a blood transfusion to Ressler. The head honcho of the mercenaries asks if Red remembers the explosive, Red says yes and asks if he’s planning to blow up the box. The head mercenary wants Red to speak to him, Red isn’t really saying much to him. The bearded cop is still working on his laptop, and decides to take out his handgun to move out. The mercenaries are picking up a whole lot of C4 to blow up the box, one of them is interrupted because he heard something. The mercenary shoots a man who was already dead, Liz tells the mercenary to tell the head honcho of them that nothing is wrong; he listens and does so and Liz hits him in the face. The bearded cop found Liz, he tells her that he’s trying to recapture the telecom. Liz asks if he knows who’s hitting the facility, and she wants to know how long it’ll take to get the telecom back, he’s not sure. Liz asks if the generators were disabled would it reset the telecom, he says yes. Liz says perfect and tells the bearded cop that they’re going to go and disable to generators. Red asks if Ressler is feeling any witter now, since the blood transfusion. Red asks if he can ask something, he asks about Audrey and what happened. Ressler tells him that Audrey left him, because of him trying to chase after Red for five years. The mercenaries find the others who were knocked out, he contacts the head honcho that there’s someone who’s going around. Ressler asks how Red knows about his ex, Red says he knows a lot about him. Ressler says that he doesn’t know how Red abandoned his flag, Red says we become who we are; that we should never judge a book by it’s cover, only when your in a couple of chapters or at the last page. Red asks if Ressler has ever sailed across a ocean, Ressler says no. Ressler goes more into depth about sailing the seas and mentions how he wants that one more time. That he wants another meal in Paris, another bottle of win and the warmth of a woman. One more night of jazz with the vanguard, feel the sun on his face, to walk on the wall again, climb the tower. Red is telling Ressler everything he wants to do before he dies, at the end he says most of all he wants to sleep like he did when he was a boy, that one time would be enough to sleep like that. That’s why Red doesn’t want the mercenaries to get the best of him, nor the last of him. Harold arrives at the head honcho of the mercenary, he wants to get the box open; but Harold wants his people to be safe. The head honcho doesn’t want to do that, he wants to get into the box and believes he can get someone else to do it; Harold says he can do it if he bets on it. Red then says that it would be stupid for the head honcho to shoot Harold, that he means nothing to him; but Harold is the only man who can give Red’s head to him. Ressler isn’t doing to well in the box, the wound if starting to become fatal. The head honcho asks Red how many people are going to die today, Red is starting to try and help Ressler; now he’s going to close the wound in his leg. Red needs to do something incredibly painful to help him, if Ressler doesn’t tell them how to open the box. Red is going to try and do this as quick as he can, but Ressler needs to stay still the entire time. Liz and bearded cop are making their way to the generator, to scramble these devices to reset the telecom. The telecom system is 30% ready to reset. Red is still working on Resslers wound, this looks like a very painful process. Red burns the wound and it looks like he was successful. The head honcho decides to shoot and kill Luli in front of Red, Red does not look pleased at all. Red turns away and looks at Ressler. Liz is interrupted by the mercenary she knocked out earlier, this time he knocks her out. The honcho now has Dembe on his knees and a gun pointed at this head, Red looks at Harold and tells him to say the code. Red is trying to get Ressler to say the code, Dembe says that the friendship forged in this life will be in the next. Red asks Harold to open the box, that he would give anything. Red begins tell Dembe something in another language, then a gunshot is heard and it goes black.